Back from the vault!! Sleeping Beauty!!!!!!! Despite the costly nature of inking, it also has a huge benefit. Namely, the art in this thing is luscious. There are fantastic character designs, rich sets, and incredibly detailed and beautiful outdoor landscapes. I specifically remember most of the scenes in the woods as standouts. In a nutshell, this movie makes me feel the same way I did during Avatar – I just can’t believe someone was able to make a movie so visually impactful. Forsooth, SB is amazing. Add in the native widescreen presentation and it is a shoe-in purchase for any lovers of Disney, animation, cinematography, art or just lovers of fine aesthetics. Problem is, before yesterday, a new copy of SB on blu-ray cost somewhere around $80, a handsome sum too steep for most average folks. Of course, you could get the film on DVD, but since blu-ray is the ultimate in hi-def visuals, and since these visuals are too good for a less-than-premium presentation, well…. buying it on DVD wasn’t an option. That’s why I’m so glad to see that Disney has brought Sleeping Beauty out of the vault, making it available on blu-ray once again for the reasonable sum of $19.99. Also included are DVD and digital versions of the film. All in all, I can’t think of anything to say except BUY IT. Disney is notorious for yanking films off the market, so snag a copy before they’re $80 again. Mayhap it would be the perfect Christmas gift? 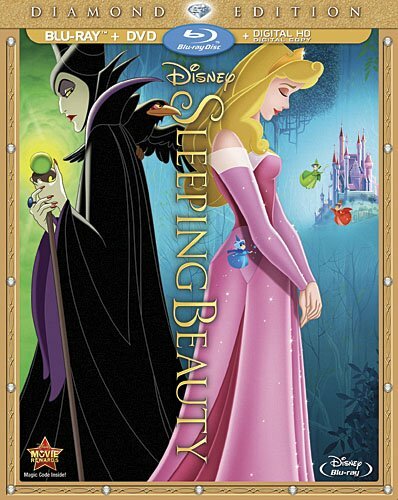 Click here to purchase Sleeping Beauty on blu-ray. Also, for you VHS-philes, thankfully there are somehow some copies of SB still available on VHS. Despite steady and universal economic inflation, this version of the film has defied all odds and stands available for purchase at prices lower than ever. Now’s your chance to make your dream come true and finally own this amazing film on the best home movie format of 1997!!! Click here to purchase Sleeping Beauty on VHS. You know you want to.